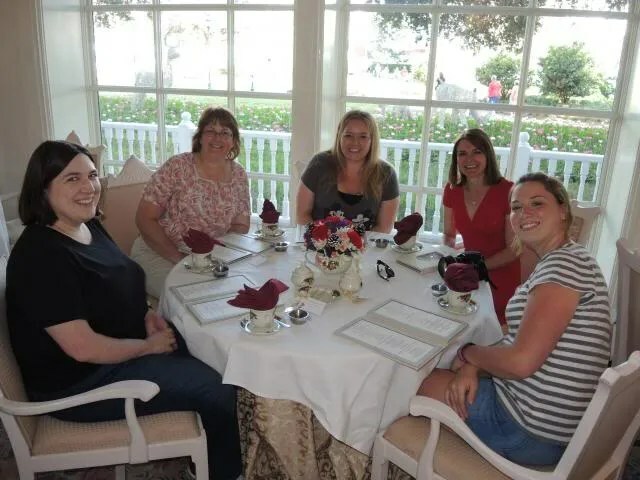 Our Afternoon Tea was attended by nine ladies and one gentleman, so we were seated at two tables. Seated at my table were DeeDee, me, Sue (another fellow member of the DIS boards), Linda and Rachel. We had only one server for the 10 of us. 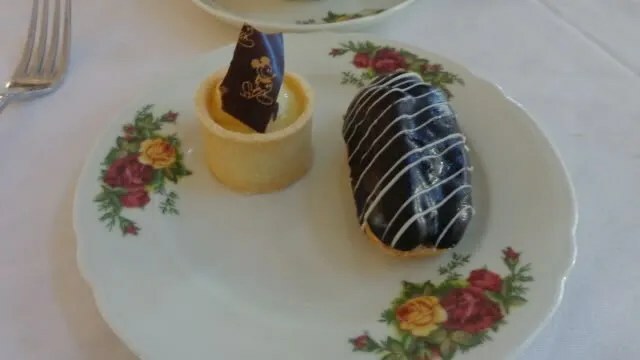 Although she was nice, I think having this many people to deal with sent her into a bit of a tail spin so service this afternoon was slow to say the least and afternoon tea very nearly turned into a midnight snack. 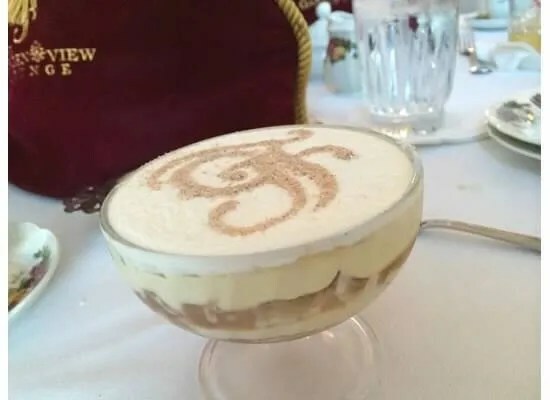 Most of group ordered the Buckingham Palace (Menu description: Our traditional tea sandwiches, scones and jam tarts complemented by fresh strawberries and cream, English trifle or a selection of freshly baked pastries, along with your choice of tea). 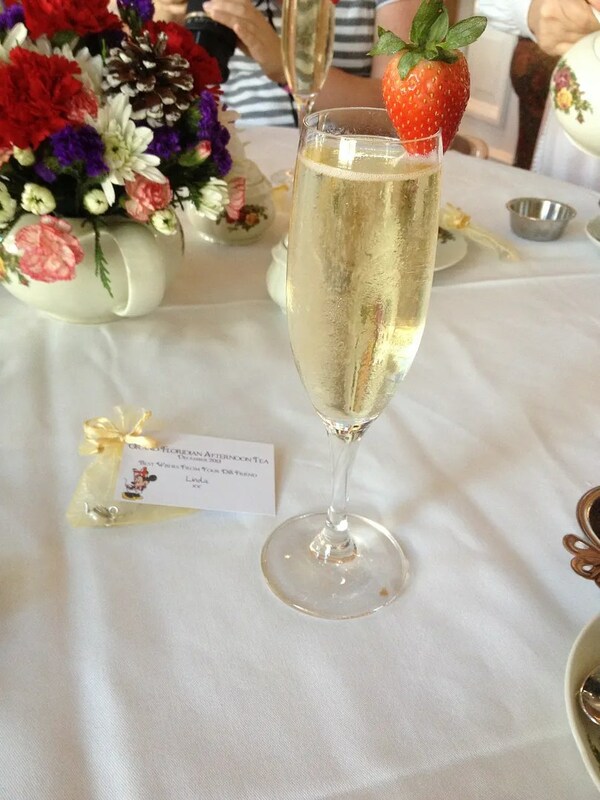 However a few of us, including me, had the Grand Tea which also included a glass of sparkling wine. 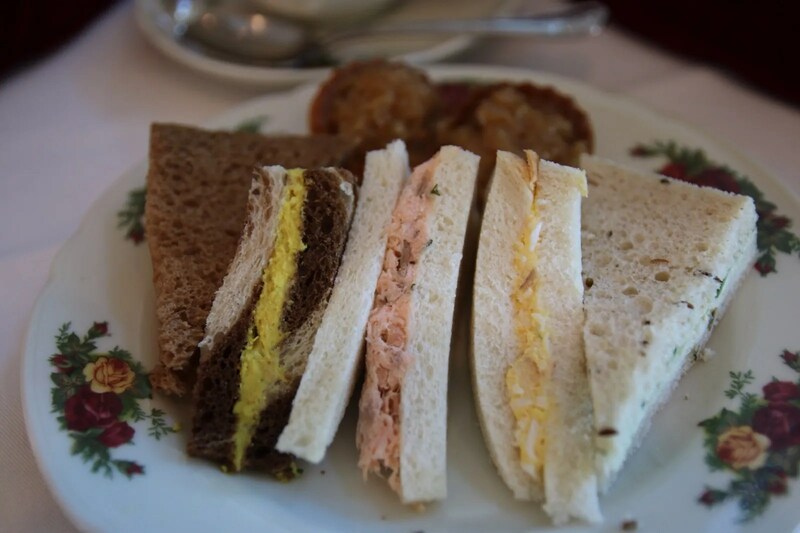 The five sandwiches which were normally served with the 1st course were Pear & Gorgonzola, Curried Chicken salad, Salmon salad, Egg salad, and Cucumber, Cream Cheese & Watercress. However, I believe only Rachel had these standard five, without making any substitutions. Linda doesn’t eat meat, so she asked for her sandwiches to be all non-meat options. It looks like she ended up with two cucumber, two egg salad and a gorgonzola and pear. 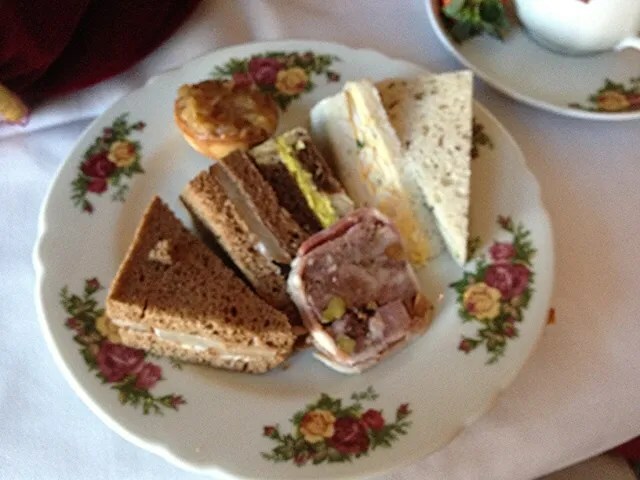 Also instead of the pate that normally comes with the sandwiches of the Grand Tea, she had two of the delicious onion tarts. I wish I would have thought to sub the pate (which I didn’t really cafe for) for an extra onion tart, which I love. 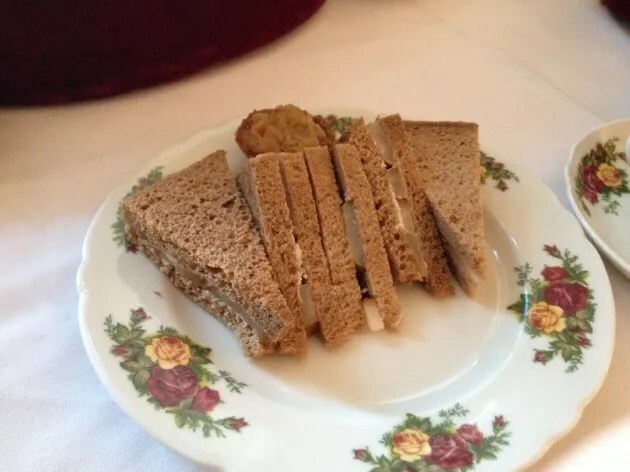 I did though remember to substitute the salmon salad sandwich (which I didn’t like my last time here) for an extra gorgonzola and pear, which is my favorite of the tea sandwiches. Brenda also didn’t like the salmon so substituted it for a peanut butter and jelly one. Emily doesn’t like most of the sandwiches that are usually served so asked for three gorgonzola and pear sandwiches and two ham and cheese. 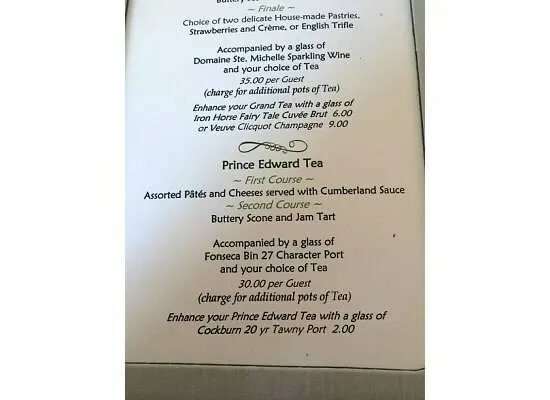 Next we were served warm scones, Devonshire cream, strawberry jam and lemon curd. 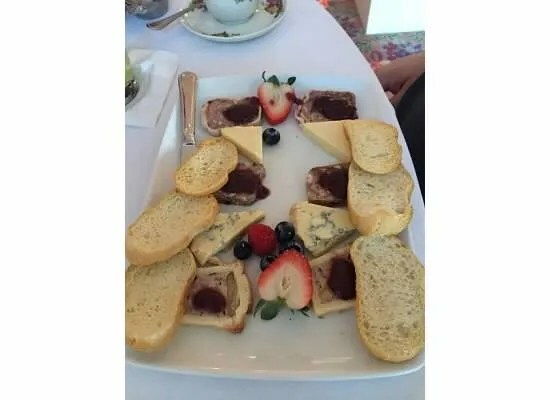 While we all loved the scones, some of us (including me) preferred our scone topped with the Devonshire cream and others were fans of the lemon curd or the strawberry jam. Other than Paula and her trifle, everyone seemed please with their choice. 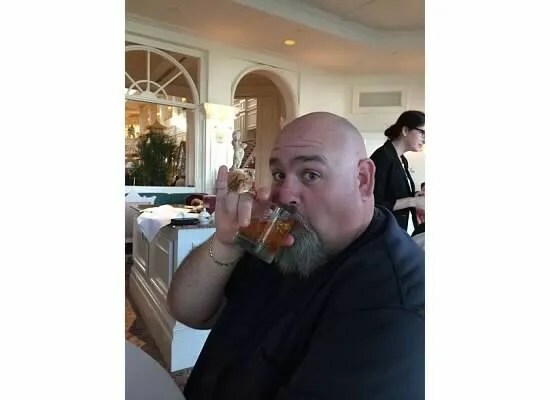 And like a proper lady or gentleman, Hunter lifted his pinky when drinking his Russian Earl Grey tea and the “tea” he prefers! (A Johnny Walker Black Label). 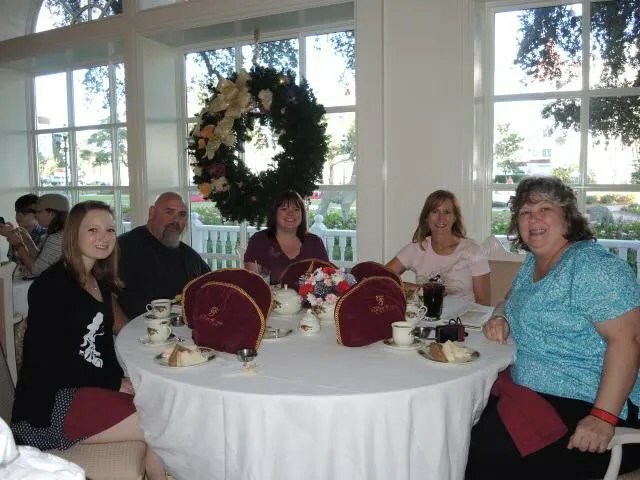 So overall the food at our tea was delicious, the only downside was the service. It was slower than slow. We had one server for the 10 of us seated at two tables and when ordering we requested 8 separate checks. So from the beginning she seemed flustered, but by the end (which was more than 2 hours later) when she presented us with our checks and most of us pulled out our Tables in Wonderland cards…well, I thought the poor girl’s head was going to explode.